An ocean (from Ancient Greek Ὠκεανός , transc. Okeanós  ) is a body of water that composes much of a planet's hydrosphere. On Earth, an ocean is one of the major conventional divisions of the World Ocean. These are, in descending order by area, the Pacific, Atlantic, Indian, Southern (Antarctic), and Arctic Oceans. The word "ocean" is often used interchangeably with "sea" in American English. Strictly speaking, a sea is a body of water (generally a division of the world ocean) partly or fully enclosed by land,  though "the sea" refers also to the oceans. Oceanus, also known as Ogenus or Ogen, was a divine figure in classical antiquity, believed by the ancient Greeks and Romans to be the divine personification of the sea, an enormous river encircling the world. Saline water is water that contains a high concentration of dissolved salts. The salt concentration is usually expressed in parts per thousand or parts per million (ppm). 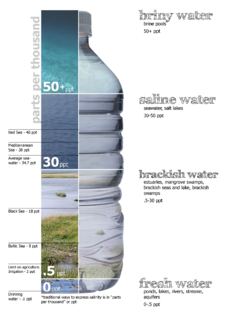 The United States Geological Survey classifies saline water in three salinity categories. Salt concentration in slightly saline water is around 1,000 to 3,000 ppm (0.1–0.3%), in moderately saline water 3,000 to 10,000 ppm (0.3–1%) and in highly saline water 10,000 to 35,000 ppm (1–3.5%). Seawater has a salinity of roughly 35,000 ppm, equivalent to 35 grams of salt per one liter of water. The saturation level is dependent on the temperature of the water. At 20 °C one liter of water can dissolve about 357 grams of salt, a concentration of 26.3%. At boiling (100 °C) the amount that can be dissolved in one liter of water increases to about 391 grams, a concentration of 28.1%. The biosphere also known as the ecosphere, is the worldwide sum of all ecosystems. It can also be termed the zone of life on Earth, a closed system, and largely self-regulating. By the most general biophysiological definition, the biosphere is the global ecological system integrating all living beings and their relationships, including their interaction with the elements of the lithosphere, geosphere, hydrosphere, and atmosphere. The biosphere is postulated to have evolved, beginning with a process of biopoiesis or biogenesis, at least some 3.5 billion years ago. Oceanography, also known as oceanology, is the study of the physical and biological aspects of the ocean. 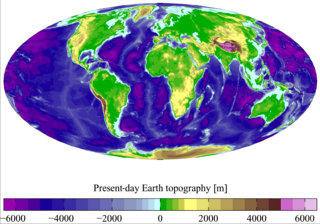 It is an Earth science, which covers a wide range of topics, including ecosystem dynamics; ocean currents, waves, and geophysical fluid dynamics; plate tectonics and the geology of the sea floor; and fluxes of various chemical substances and physical properties within the ocean and across its boundaries. These diverse topics reflect multiple disciplines that oceanographers blend to further knowledge of the world ocean and understanding of processes within: astronomy, biology, chemistry, climatology, geography, geology, hydrology, meteorology and physics. Paleoceanography studies the history of the oceans in the geologic past. The lakes of Titan, Saturn's largest moon, are bodies of liquid ethane and methane that have been detected by the Cassini–Huygens space probe, and had been suspected long before. The large ones are known as maria (seas) and the small ones as lacūs (lakes). The word ocean comes from the figure in classical antiquity, Oceanus ( /oʊˈsiːənəs/ ; Greek : Ὠκεανός Ōkeanós,  pronounced [ɔːkeanós] ), the elder of the Titans in classical Greek mythology, believed by the ancient Greeks and Romans to be the divine personification of the sea, an enormous river encircling the world. In Greek mythology, the Titans and Titanesses were a race of deities: members of the second generation of divine beings—succeeding the primordial deities and preceding the Olympians—as well as certain descendants of this second generation. Based on Mount Othrys, the Titans most famously included the first twelve children of Gaia and Uranus. They ruled during the legendary Golden Age, and also comprised the first pantheon of Greek deities. If a zone undergoes dramatic changes in temperature with depth, it contains a thermocline. The tropical thermocline is typically deeper than the thermocline at higher latitudes. Polar waters, which receive relatively little solar energy, are not stratified by temperature and generally lack a thermocline because surface water at polar latitudes are nearly as cold as water at greater depths. Below the thermocline, water is very cold, ranging from −1 °C to 3 °C. 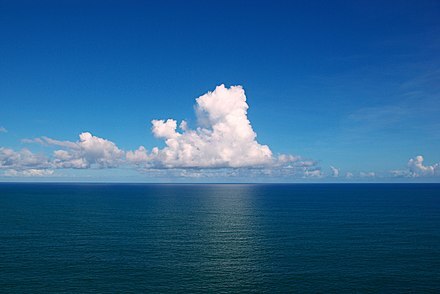 Because this deep and cold layer contains the bulk of ocean water, the average temperature of the world ocean is 3.9 °C. [ citation needed ] If a zone undergoes dramatic changes in salinity with depth, it contains a halocline. If a zone undergoes a strong, vertical chemistry gradient with depth, it contains a chemocline. 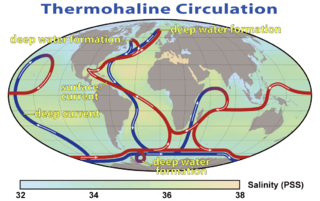 Oceanic maritime currents have different origins. Tidal currents are in phase with the tide, hence are quasiperiodic; they may form various knots in certain places,[ clarification needed ] most notably around headlands. Non-periodic currents have for origin the waves, wind and different densities. The Mars ocean hypothesis suggests that nearly a third of the surface of Mars was once covered by water, though the water on Mars is no longer oceanic (much of it residing in the ice caps). The possibility continues to be studied along with reasons for their apparent disappearance. Astronomers think that Venus had liquid water and perhaps oceans in its very early history. [ citation needed ] If they existed, all later vanished via resurfacing. Seawater, or salt water, is water from a sea or ocean. On average, seawater in the world's oceans has a salinity of about 3.5%. This means that every kilogram of seawater has approximately 35 grams (1.2 oz) of dissolved salts. 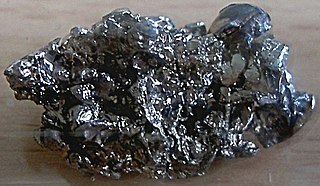 Average density at the surface is 1.025 kg/L. Seawater is denser than both fresh water and pure water because the dissolved salts increase the mass by a larger proportion than the volume. The freezing point of seawater decreases as salt concentration increases. At typical salinity, it freezes at about −2 °C (28 °F). The coldest seawater ever recorded was in 2010, in a stream under an Antarctic glacier, and measured −2.6 °C (27.3 °F). Seawater pH is typically limited to a range between 7.5 and 8.4. However, there is no universally accepted reference pH-scale for seawater and the difference between measurements based on different reference scales may be up to 0.14 units. Physical oceanography is the study of physical conditions and physical processes within the ocean, especially the motions and physical properties of ocean waters. A thermocline is a thin but distinct layer in a large body of fluid in which temperature changes more rapidly with depth than it does in the layers above or below. In the ocean, the thermocline divides the upper mixed layer from the calm deep water below. In oceanography, a halocline is a subtype of chemocline caused by a strong, vertical salinity gradient within a body of water. Because salinity affects the density of seawater, it can play a role in its vertical stratification. Increasing salinity by one kg/m3 results in an increase of seawater density of around 0.7 kg/m3. The deep sea or deep layer is the lowest layer in the ocean, existing below the thermocline and above the seabed, at a depth of 1000 fathoms or more. Little or no light penetrates this part of the ocean, and most of the organisms that live there rely for subsistence on falling organic matter produced in the photic zone. For this reason, scientists once assumed that life would be sparse in the deep ocean, but virtually every probe has revealed that, on the contrary, life is abundant in the deep ocean. 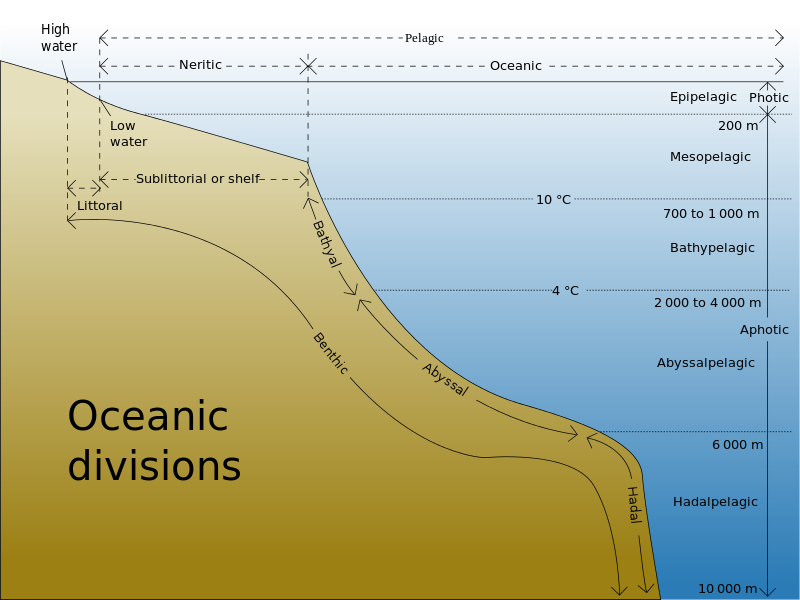 The oceanic or limnological mixed layer is a layer in which active turbulence has homogenized some range of depths. The surface mixed layer is a layer where this turbulence is generated by winds, surface heat fluxes, or processes such as evaporation or sea ice formation which result in an increase in salinity. 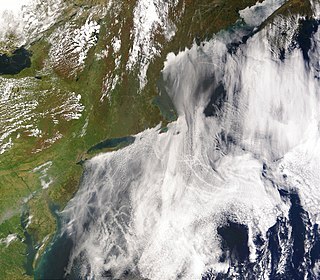 The atmospheric mixed layer is a zone having nearly constant potential temperature and specific humidity with height. The depth of the atmospheric mixed layer is known as the mixing height. Turbulence typically plays a role in the formation of fluid mixed layers. An ocean planet, ocean world, water world, aquaplanet or panthalassic planet is a type of terrestrial planet that contains a substantial amount of water either at its surface or subsurface. The term ocean world is also used sometimes for astronomical bodies with an ocean composed of a different fluid, such as lava, ammonia or ethane. Extraterrestrial liquid water is water in its liquid state that naturally occurs outside Earth. It is a subject of wide interest because it is recognized as one of the key prerequisites for life as we know it and thus surmised as essential for extraterrestrial life. The sea, the world ocean or simply the ocean is the connected body of salty water that covers over 70 percent of the Earth's surface. It moderates the Earth's climate and has important roles in the water cycle, carbon cycle and nitrogen cycle. It has been travelled and explored since ancient times, while the scientific study of the sea—oceanography—dates broadly from the voyages of Captain James Cook to explore the Pacific Ocean between 1768 and 1779. The word "sea" is also used to denote smaller, partly landlocked sections of the ocean and certain large, entirely landlocked, saltwater lakes such as the Caspian Sea and the Dead Sea. A deep sea community is any community of organisms associated by a shared habitat in the deep sea. Deep sea communities remain largely unexplored, due to the technological and logistical challenges and expense involved in visiting this remote biome. Because of the unique challenges, it was long believed that little life existed in this hostile environment. Since the 19th century however, research has demonstrated that significant biodiversity exists in the deep sea. Almost all water on Mars today exists as ice, though it also exists in small quantities as vapor in the atmosphere, and occasionally as low-volume liquid brines in shallow Martian soil. The only place where water ice is visible at the surface is at the north polar ice cap. Abundant water ice is also present beneath the permanent carbon dioxide ice cap at the Martian south pole and in the shallow subsurface at more temperate conditions. More than 21 million km3 of ice have been detected at or near the surface of Mars, enough to cover the whole planet to a depth of 35 meters (115 ft). Even more ice is likely to be locked away in the deep subsurface. Paleosalinity is the salinity of the global ocean or of an ocean basin at a point in geological history. Effects of global warming on oceans provides information on the various effects that global warming has on oceans. Global warming can affect sea levels, coastlines, ocean acidification, ocean currents, seawater, sea surface temperatures, tides, the sea floor, weather, and trigger several changes in ocean bio-geochemistry; all of these affect the functioning of a society. ↑ "Ὠκεανός". Perseus Digital Library . Retrieved May 17, 2012. ↑ Charette, Matthew; Smith, Walter H. F. (2010). "The volume of Earth's ocean". Oceanography. 23 (2): 112–114. doi:10.5670/oceanog.2010.51 . Retrieved 27 September 2012. ↑ "CIA World Factbook". CIA . Retrieved 2015-04-05. 1 2 "Pacific Ocean". Encyclopedia of Earth . Retrieved 2015-03-07. 1 2 "'Arctic Ocean' – Encyclopædia Britannica" . Retrieved 2012-07-02. As an approximation, the Arctic Ocean may be regarded as an estuary of the Atlantic Ocean. 1 2 "Recommendation ITU-R RS.1624: Sharing between the Earth exploration-satellite (passive) and airborne altimeters in the aeronautical radionavigation service in the band 4 200–4 400 MHz (Question ITU-R 229/7)" (PDF). ITU Radiotelecommunication Sector (ITU-R) . Retrieved 2015-04-05. The oceans occupy about 3.35×108 km2 of area. There are 377412 km of oceanic coastlines in the world. ↑ Drazen, Jeffrey C. "Deep-Sea Fishes". School of Ocean and Earth Science and Technology, the University of Hawaiʻi at Mānoa . Retrieved 2007-06-07. ↑ Holladay, April (November 21, 2005). "A glowing sea, courtesy of algae". USA Today . ↑ "Sea's eerie glow seen from space". New Scientist . October 5, 2005. ↑ Casey, Amy (August 8, 2003). "The Incredible Glowing Algae". NASA Earth Observatory . NASA. ↑ "Can the ocean freeze? Ocean water freezes at a lower temperature than freshwater". NOAA. Retrieved January 2, 2019. 1 2 Platt, Jane; Bell, Brian (2014-04-03). "NASA Space Assets Detect Ocean inside Saturn Moon". NASA . Retrieved 2014-04-03. ↑ Iess, L.; Stevenson, D.J. ; Parisi, M.; Hemingway, D.; et al. (4 April 2014). "The Gravity Field and Interior Structure of Enceladus". Science . 344 (6179): 78–80. Bibcode:2014Sci...344...78I. doi:10.1126/science.1250551. PMID 24700854 . Retrieved 3 April 2014. ↑ Dyches, Preston; Chou, Felcia (7 April 2015). "The Solar System and Beyond is Awash in Water". NASA . Retrieved 8 April 2015. ↑ Wiktorowicz, Sloane J.; Ingersoll, Andrew P. (2007). "Liquid water oceans in ice giants". Icarus. 186 (2): 436–447. arXiv: astro-ph/0609723 . Bibcode:2007Icar..186..436W. doi:10.1016/j.icarus.2006.09.003. ISSN 0019-1035. ↑ Vance, Steve; Bouffard, Mathieu; Choukroun, Mathieu; Sotina, Christophe (12 April 2014). 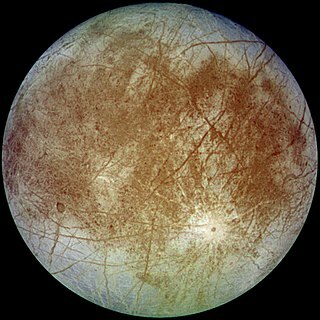 "Ganymede's internal structure including thermodynamics of magnesium sulfate oceans in contact with ice". Planetary and Space Science. 96: 62–70. Bibcode:2014P&SS...96...62V. doi:10.1016/j.pss.2014.03.011 . Retrieved 2014-05-02. 1 2 Hussmann, Hauke; Sohl, Frank; Spohn, Tilman (November 2006). "Subsurface oceans and deep interiors of medium-sized outer planet satellites and large trans-neptunian objects" (PDF). Icarus . 185 (1): 258–273. Bibcode:2006Icar..185..258H. doi:10.1016/j.icarus.2006.06.005. ↑ Fox, Maggie (May 16, 2007). 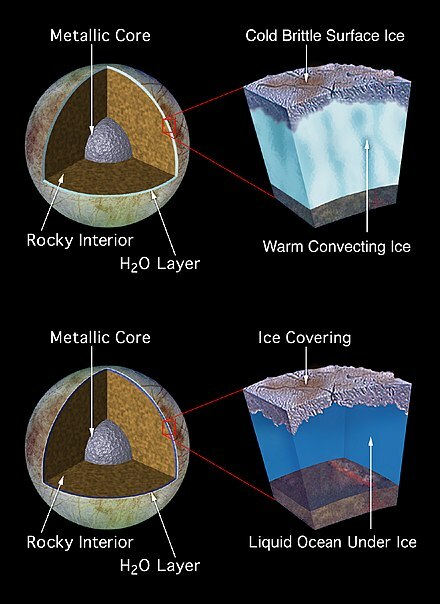 "Hot "ice" may cover recently discovered planet". Reuters . Retrieved May 18, 2012. ↑ Elkins-Tanton (2010). "Formation of Early Water Oceans on Rocky Planets". Astrophysics and Space Science. 332 (2): 359–364. arXiv: 1011.2710 . Bibcode:2011Ap&SS.332..359E. doi:10.1007/s10509-010-0535-3. ↑ Schaefer, Laura; Fegley, Bruce, Jr. (2009). "Chemistry of Silicate Atmospheres of Evaporating Super-Earths". The Astrophysical Journal Letters. 703 (2): L113–L117. arXiv: 0906.1204 . Bibcode:2009ApJ...703L.113S. doi:10.1088/0004-637X/703/2/L113. ↑ Guillot, T. (1999). "A comparison of the interiors of Jupiter and Saturn" (Submitted manuscript). Planetary and Space Science. 47 (10–11): 1183–200. arXiv: astro-ph/9907402 . Bibcode:1999P&SS...47.1183G. doi:10.1016/S0032-0633(99)00043-4. Pope, F. 2009. From eternal darkness springs cast of angels and jellied jewels. inThe Times. November 23. 2009 pp. 16–17. Wikimedia Commons has media related to Ocean .